I value the opportunity to share my knowledge, research and experience in minimally-invasive restorative dentistry. Modern dental care can be dramatically improved as more dentists are educated on the benefits of biomimetic dentistry, says Dr. Nejad of Helm Nejad Stanley Dentistry. 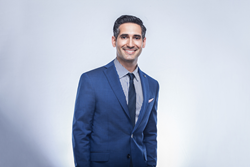 Dr. Matt Nejad, a lead dentist at an upscale dental practice in Beverly Hills, is best known for his elite training and sought-after expertise in biomimetic dentistry and cosmetic dentistry. Biomimetic dentistry is a unique dental specialty that employs minimally-invasive techniques and a natural approach in restorative dentistry which aims to mimic the natural tooth in strength, function, esthetics, and biology/health. The correct application of materials and technique allows dentists to preserve more natural tooth structures and deliver more sustainable, longer-term results. As both a practicing biomimetic dentist as well as an educator in the field, Dr. Nejad was invited to speak at the 11th USC International Restorative Dentistry Symposium on October 13, 2018 in Los Angeles. Dr. Nejad will discuss the topic of Poster Onlay and Inlay restorations, a dental treatment growing in popularity due to concerns over removing additional tooth structure for crowns and the ensuing complications. Applying the bioimimetic approach, teeth can be restored with conservative measures that often result in significantly less loss of natural, healthy tooth structures. This not only gives the best ultimate strength and long-term success, but also minimizes the occurrence of root canals and other invasive treatments. “I value the opportunity to share my knowledge, research and experience in minimally-invasive restorative dentistry. Modern dental care can be dramatically improved as more dentists are educated on the benefits of biomimetic dentistry,” says Dr. Nejad of Helm Nejad Stanley Dentistry. To register for the 11th annual USC international symposium call 213.821.2127. Additional courses are available yearly at http://www.biomimeticdentistryCE.com. Patients interested in biomimetic dentistry, please visit http://www.HNSdentistry.com or call (310) 278-0440. Dr. Nejad was trained and mentored by the global father of Biomimetic Dentistry, Pascal Magne. Other dentists and dental professionals have the opportunity to learn from Dr. Nejad through his continuing education courses offered in Beverly Hills as well as dental conferences throughout the United States. Dr. Nejad teaches multiple Biomimetic Training classes throughout the year to those interested in implementing biomimetic dentistry techniques in their own practice. Dr. Nejad has earned prestigious awards for his expertise and has been featured in multiple respected publications, including The New York Post, Women’s Health, Prevention magazine and more.